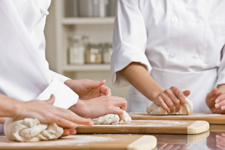 The Scottish Vocational Qualification (SVQ) in Food and Drink Operations (Craft Bakery Skills) at SCQF level 5 allows candidates to demonstrate competence in job related skills in their particular area of work and expertise. This qualification covers areas such as food safety standards in manufacture, working safely, and producing and finishing bakery products using machinery. This SVQ must be assessed in the workplace, therefore it is only suitable for individuals employed in the food industry. The SVQ in Food and Drink Operations (Craft Bakery Skills) at SCQF level 5 consists of 2 mandatory units and 6 optional units. GG4V 22 is jointly awarded with NSAFD. GG5Y 22 is jointly awarded with Scottish Bakers.